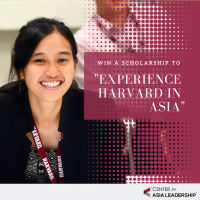 How in step is your leadership with the messy, complex challenges of 21st century Asia? Asia is the fastest growing region in the world – and will continue to be for the next decade. But riding the wave of innovation and disruption means not just acquiring previously unheard of technical skills but also understanding the human side of initiating change. The Asia Leadership Forum is where the realities and contradictions of the region are seen through the lens of leading-edge Harvard thought leadership. It is where leaders come together to clarify their values, their True north in a world that is constantly spinning.